October 10th, 2009 ::: The Sneeze Peaks section of this site will be where we will post works in progress and info about our upcoming albums. For now, I'm posting a demo I've made for the Gristleizer pedal we make at Endangered Audio. 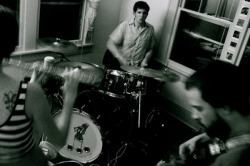 In the end, there will be more instrumentation and Drew's drumming instead of a default loop. Instrumentation: Mark: Electric guitar, Electrone Organ, Ableton synth bass, drum loops.